President Edgar Lungu has directed all parastatal companies to hire Arm Safety Security Company, in which he is the major share holder to provide security services. Sources from the Industrial Development Corporation (IDC) told the Zambian Watchdog that the Head of State had directed that parastatals terminate all contracts with other companies and engage Arm Safety Security. “This security company is manning all our boarders across the country because of the contract with ZRA and you will find them at Zanaco,” said the source. 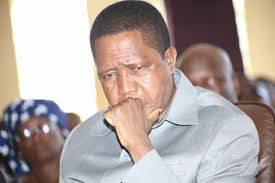 The source revealed that President Lungu is the major share holder in the security company and that his shares were being held by the daughter, Tasila. A snap survey by the Zambian watchdog revealed that Arm Safety Security was providing security services for all NAPSA infrastructure such as Levy Mall in Lusaka, Mukuba Mall, and all the Zanaco branches. Some senior managers spoken to who spoke on condition of anonymity confirmed that the President was the owner of one of the fastest growing companies in Zambia. Meanwhile some of the security personal spoken to complained of poor working conditions. “We are paid K850 per month but we do not get this money on time. Sometime more than two months pass without getting paid,” a guard who sought anonymity told the watchdog. Government recently increased the minimum wage for domestic workers to K1000.